A very interesting IMF working paper on sustainability and effectiveness of fiscal policy in Ukraine that cuts rather dramatically across the official IMF policy blather. Fiscal Multipliers in Ukraine, by Pritha Mitra and Tigran Poghosyan, IMF Working Paper, March 2015, WP/15/71 looks at the role of fiscal policy (spending and investment) in the Ukrainian economy. Today, even after the recent float of the Ukrainian hryvnia, fiscal policy remains key to economic stabilization." "Over the past five years, the government relied on real public wage and pension hikes to stimulate economic activity, sometimes at the expense of public infrastructure spending. Many argue that this choice of fiscal instruments undermined private sector growth and contributed to the economy falling back into recession in mid-2012." Since the IMF bailout, however, fiscal adjustment is now aiming for a reversal of long term imbalances on spending and revenue sides. In simple terms, fiscal adjustment now became a critical basis for addressing the economic and financial crisis. As the result, the IMF study looked at the effectiveness of various fiscal policy instruments. The reason for the need for rebalancing fiscal policy in Ukraine is that current environment is characterised by "…the severe crisis, its toll on tax revenues, and financing constraints, necessitate fiscal consolidation. But the challenge is to minimize its negative impact on growth." In other words, the key questions are: "Will tax hikes or spending cuts harm growth more? Does capital or current spending have a stronger impact on economic activity?" Quantitatively, the paper attempts to estimate "…the fiscal multiplier – the change in output, relative to baseline, following an exogenous change in the fiscal deficit that stems from a change in revenue or spending policies." "Applying a structural vector auto regression, the empirical results show that Ukraine’s near term fiscal multipliers are well below one. Specifically, the impact revenue and spending multipliers are -0.3 and 0.4, respectively. This suggests that if a combination of revenue and spending consolidation measures were pursued, the near-term marginal impact on growth would be modest", albeit negative for raising revenue and cutting spending. "Over the medium-term, the revenue multiplier becomes insignificant, rendering it impossible to draw any conclusions on its strength. The spending multiplier strengthens to 1.4, with about the same impact from capital and current spending. However, the impact of the capital multiplier lasts longer. Against this backdrop, the adverse impact of fiscal consolidation on medium-term growth could be minimized by cutting current spending while raising that on capital." "Given the severe challenges facing the Ukrainian economy, it is important that policymakers apply these results in conjunction with broader considerations – including public debt sustainability, investor confidence, credibility of government policies, public spending efficiency. These considerations combined with the large size of current spending in the budget, may necessitate larger near- and long-term current spending cuts than what multiplier estimates suggest." In simple terms, this means that, per IMF research (note, this is not a policy directive), Ukrainian economy will need to sustain a heavy duty adjustment on the side of cutting public spending on current expenditure programmes (wages, pensions, purchasing of services, provision of services, social welfare, health, etc) and, possibly, provide small, only partially offsetting, increase in capital spending. This would have to run alongside other measures that will raise costs of basic services and utilities for all involved. The problem, therefore, is a striking one: to deliver debt sustainability, current expenditure and price supports will have to be cut, causing massive amounts of pain for ordinary citizens. Meanwhile, infrastructure spending will have to rise (but much less than the cuts in current expenditure), which will, given Ukrainian corruption, line the pockets of the oligarchs, while providing income and jobs to a smaller subset of working population. Otherwise, the economy will tank sharply. Take your pick, the IMF research suggests: public unrest because of cut-backs to basic expenditures, or an even deeper contraction in the economy. A hard choice to make. "More broadly, fiscal multipliers are one of many tools policymakers should use to guide their decisions. 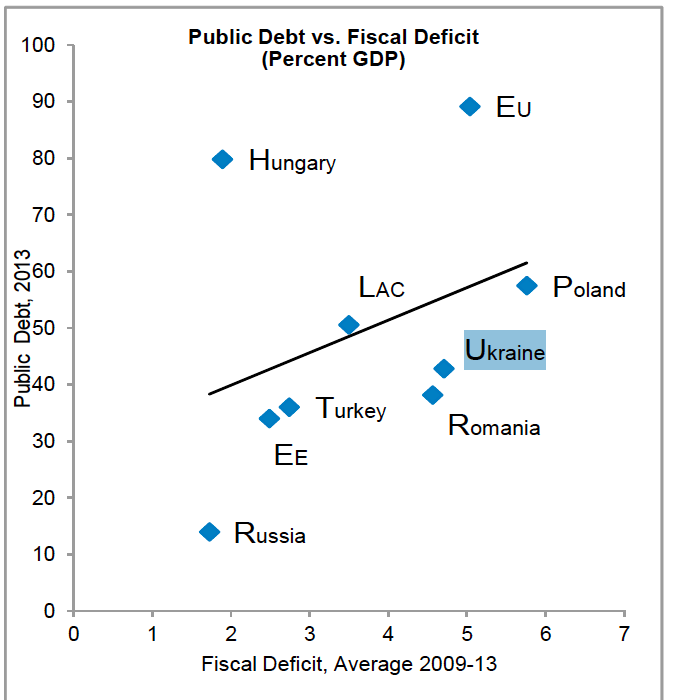 Given the severe challenges facing the Ukrainian economy – including public debt sustainability, low investor confidence, and subsequent limited availability of financing – it may be necessary for policymakers to undertake stark consolidation efforts across both revenues and expenditures, despite the adverse consequences for growth."